I'm trying to do some graphs showing how house prices respond to high inflation. I have found an excellent spread sheet with quarterly house price inflation back to 1952, but I cant find an Excel spreadsheet of UK quarterly inflation over the period 1952 (approx) to date. What do you notice between 1920 and 1951? A couple of points to note on that would be 1920 - reduction in silver from 92.5 to 50%, 1948 - removal of silver from UK coinage. No significance in the year 1952 except its when Nationwide started their data tabulation for house prices. Have you posted on the wrong thread? What do you think may have been responsible for the insane increase in the rate of inflation from the early 70s?. Have just tried to use the data and unfortunately it is not in the format I need. I've got monthly RPI back to 1949 and CPI back to 1989 if that's any good to you. If so get your pm switched on and I'll send it across. Welcome - I've got your email so go ahead and remove it from your post if you want. I'll get you the data shortly. How important is inflation to this government? - i think its an important question to ask and something the media haven't really picked up on. Does Osborne know what inflation and its affects are? I ask this because i am sure Mervin King will be pressured by Osborne... in determining what is important... economic growth or inflation. A bit of history; Inflation before Maggie was controlled by controlling wages which she was opposed to. For businesses this was great as a warehouse worker was only entitles to a certain wage. She said it could be controlled using interest rates, thus the huge rises when we had hyper inflation. she clearly did a wonderful job of it, she was pm in the 50s wasnt she? 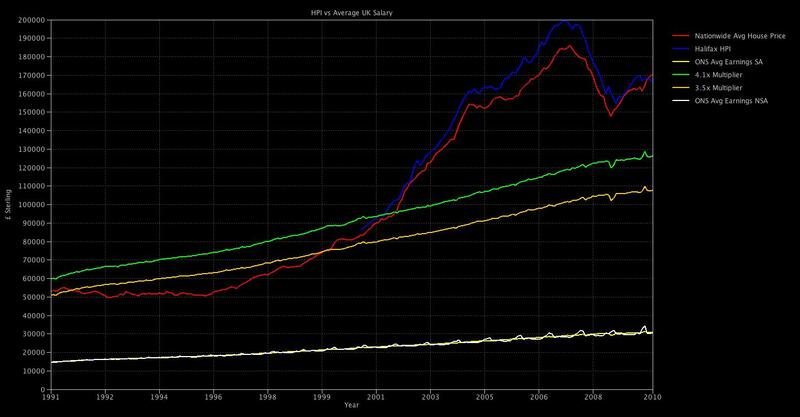 My graphing skills aren't up to overlaying house prices and inflation in a single chart, but I keep this one updated from the ONS average earnings index to show wage inflation. The right edge of the chart is a little misleading due to the delay in earnings data compared to hpi indexes. The earnings data is generally revised for the previous month as well. The multipliers are based on the SA earnings figures for smoothness. I'd love to see the effect of high core inflation combined with low wage inflation on house prices. Nice graph. It shows we need a 25% drop in house prices just to cross the 4xsalary line. I think it very unlikely that salaries will increase, if at all, for quite a while. I think it very unlikely that salaries will increase, if at all, for quite a while.